This is the place to stay in the know as to what's going on with Jackie of All Trades. I'll be posting before and afters, sharing favorite products, and showcasing web tutorials. Check it out! To stay updated on my the latest trends, and JOAT announcements, join the email list for reminder notifications. E-Design + DIY = $2500 Kitchen Overhaul! It all started when I was visiting my best friend this past summer at the home she and her family recently purchased in McGaheysville, VA. It's a great house with lots of room for her young family. But, the decor was not at all their taste. She expressed the desire to make it her own, but felt overwhelmed by the potential cost. When she called me a few weeks after the visit and said they wanted to get a plan in order, I was thrilled! I knew I could come up with a low cost solution that they could put into action as their time and budget allowed. The kitchen was top priority. - Ditch the floors, wall color and window treatments in favor for something less country and traditional and more modern and fun. - Transform the look of the cabinets without replacing them. - Add tile to the backsplash (budget permitting). - Trade out the droopy fans and brass light above the sink for a fresh look. I immediately got to work formulating a plan. The floors would be replaced in favor of a wood-look low maintenance laminate. 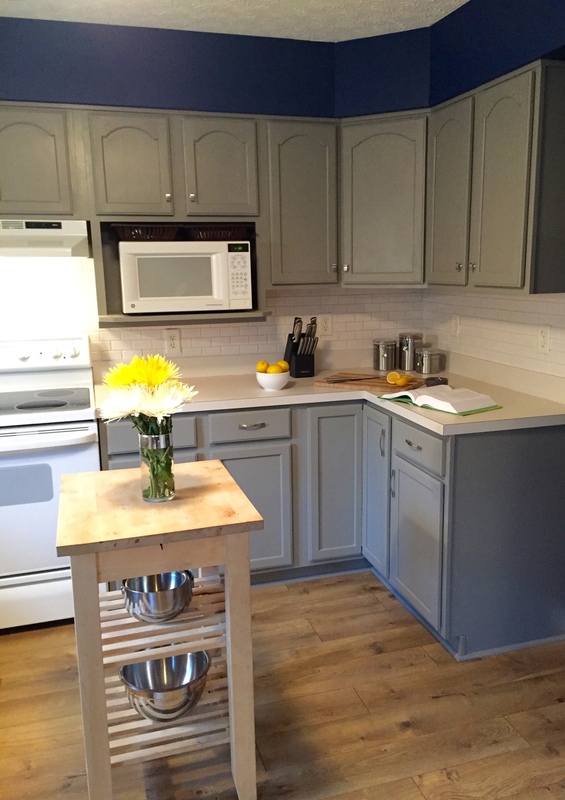 The cabinets would be painted a modern neutral gray replacing the dated washed oak. The walls would be dark giving a rich contrast to the painted cabinets. Hardware would be added to the cabinets to add sparkle and improve function. The backsplash would be bright and clean with white subway tile. The lighting style would be minimal to keep it from detracting from the rest of the room. With the ideas approved by the homeowner, I organized their work load and gave them tips on stretching their dollar. We began sourcing products that were good quality, but still budget friendly. Although I was thousands of miles away, I was there for them remotely to guide them through all of the DIY work ahead. Painting cabinets can be a daunting task, but if you tackle it with a plan and an open mind, it can be done. The first thing you need to do is LABEL EVERYTHING! You will be taking down each door and drawer, and you will need to know where it belongs when it is time to reinstall them. For this project, they started with removing 1/2 of the upper doors, and setting up a work space in their unfinished basement. Each door had to be sanded, cleaned, and painted. I recommend breaking up the work into phases. Phase 1: Sand. Use a power sander to save time on the larger surfaces. I prefer a sanding block or sanding sponge for hard to reach spots and crevices. Phase 2: Clean each piece so it is dust free. A shop-vac and tack cloth will be your best friend. Phase 3: Prime and paint. There are a lot of great products on the market to make this easy. I have had excellent luck with Home Depot's Behr Premium Plus Ultra. It has a built in primer that actually works great. However, if you are doing a bold color change, you may want to go back to basics and prime first. It will be ideal for blocking color and any dark spots in the wood grain. In the case of this project, the paint and primer in one worked great! Frames and doors are labeled. Doors are off, and the frames are exposed. Now the work can begin. As your workspace allows, line up as many doors at a time as possible. Simply set up saw horses with planks across them for an easy work surface. Doing multiple doors at a time will not only save time, but you will not be risking the finish by moving or flipping them before they are completely cured. You want to take your time so that the work is worth it. While your doors are drying, you can move on to painting the frames. It is the same process as the doors: sand, clean, paint. Once everything is cured, you can reinstall and move on to the next section working your way around the room until everything has been painted. Like painting the cabinets, floor installation can be done as a DIY project. But, for this family it was out of their comfort zone. The homeowner on this project decided to hire professionals when it came time to install the flooring. Instead of just doing the kitchen, they ended up doing the entire first floor (though that is not included in the overall budget for the kitchen). 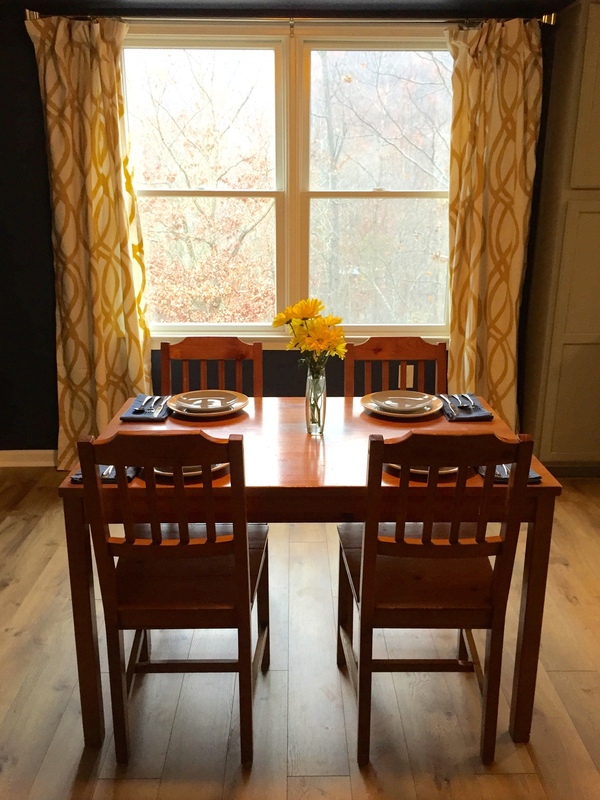 Within a few days, the damaged sheet vinyl was gone, and in it's place was beautiful laminate that offered a light color and rustic finish that accentuated the wooded mountain setting of the home while complimenting the now gray cabinetry. Step 3: Paint those Walls! As a special surprise for my friend, I decided to come back and help out in the home stretch of her renovation. I arrived just as they finished the floors and cabinets, but in time to finally see the bridesmaid dress green walls get transformed. The final color selection was Benjamin Moore's #2061-20 Champion Cobalt. The bold fresh blue is an exiting pop of color against the white trim and gray cabinets. The room was finally beginning to feel lively and be a wonderful reflection of the family that lives there. 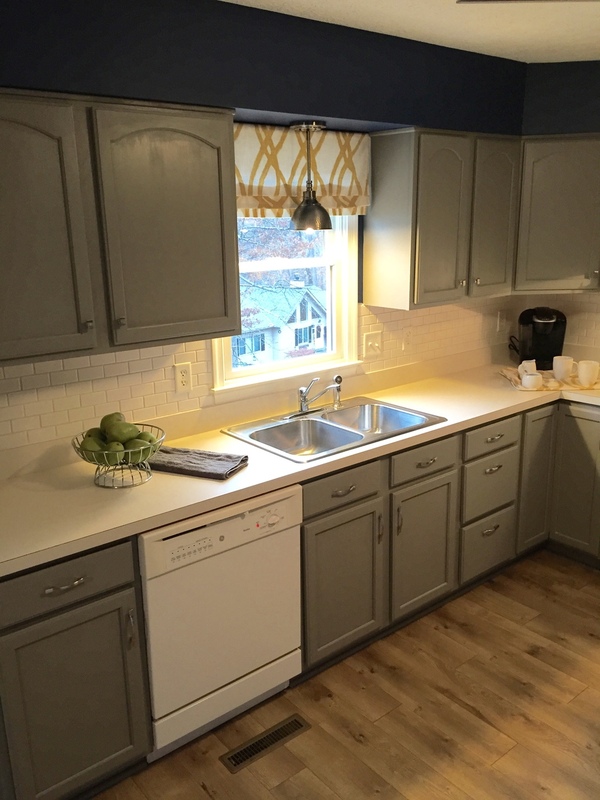 With the wall paint complete, it was up to me to guide them through the backsplash tile installation, hardware placement and installation, and lighting installation. Like the cabinet painting, tiling can seem like an overwhelming project. But, it really just takes a little planning and a prayer to the math gods that all of the cuts are easy ones. Using a mesh mounted mosaic is a great way to go when doing a backsplash. The proportions are forgiving, and lining pieces up is a snap. I prefer to use premixed mortar. It's easy to work with and you don't need to worry about the added step of mixing it and getting it to the right consistency. When installing backsplash tile, you need to use an 1/8" notched trowel to spread the mortar. Cover small sections at a time so that it doesn't dry out before you can install the tile. I like to work from the center point of each section and move outward. Doing this ensures that the corners and edges will be equal. To place the tile, gently push it onto the mortared surface. I used 1/8" spacers laid flat on the countertop's backsplash edge to give adequate spacing for the tile. Take careful measurements when cuts are needed to minimize waste. I recommend using a wet saw. It can get a bit messy, but the cuts will be clean and you won't need to worry about chipping the tile the way a score/snap tile cutters might. I recommend using a triangle to ensure your cuts are straight and marking the tile with a dry erase marker or grease pen. The marker will rinse off as you cut the tile, so as you are getting comfortable with using the wet saw, you may want to also mark the line with a piece of painters tape. As you get more comfortable with the process, the tape will not be necessary. Once the tile is in place, and has set for at least 24 hours, grouting can begin. When selecting grout color, I typically try to match the tile as closely as possible. Though, sometimes, grout can act as an accent and contrast to the tile. It really depends on the aesthetic direction you want to take. Like mortar, I prefer using premixed grout. Just spread it on with a rubber float being careful to fill in all of the spaces. It is really a process of applying and wiping off. Have a bucket of water close at hand with a large sponge. Apply. Clean off. Apply. Clean off. Keep changing out the water with each section so that the water is clear and able to thoroughly rinse the surface. By thoroughly rinsing as you go, you reduce and can even eliminate the need to use haze remover. After the grout cures for 24 hours, you can caulk all of the edges to seal your hard work and keep any potential moisture from getting through the spaces along the countertop edge. Whenever electrical work is needed, it is always recommended to call a professional. If you are out of your comfort zone, electricity is not a good thing to experiment with. But, if you have the knowledge and CUT THE POWER, you can easily to do simple home repairs in regard to electrical. We were fortunate to have enough experience on our side to change out the switches and fixtures without any trouble. Out went the old droopy traditional fans, and in went minimal modern fans that would light the room without pulling focus from all of the beautiful changes. With all of the major projects out of the way, it was time to shift gears to the finishing touches. Drapery was hung in the eating area, artwork was hung, and cabinet hardware was installed. Kitchens are full of hard surfaces, so it is important to add soft elements to provide warmth in the space. Adding patterned fabric drapery panels to the window in the eating area, and a coordinating valance above the sink, the room got a dose of personality and warmth. The ivory and ochre color combination on the fabric is a great compliment to the rich blue walls. Artwork was used minimally, but again chosen for the personality it provides. Hardware acts as the jewelry of the space. Simple knobs on the uppers and clean pulls on the lowers provided an added touch of sparkle and make the cabinets much more functional. The finished product is amazing! 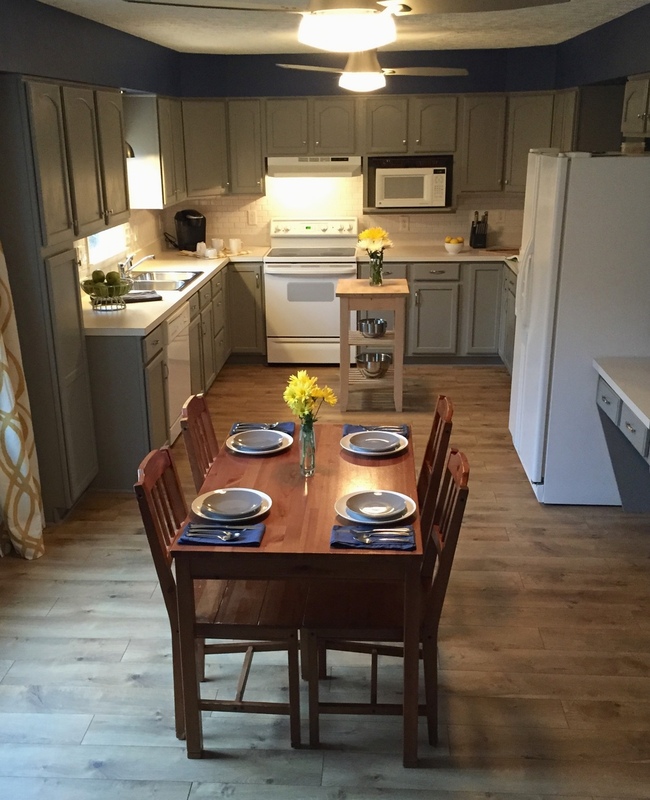 For under $2500 this young vibrant family now has a kitchen that matches their family dynamic. I couldn't be more pleased with the results. And, it's proof positive that with a solid plan and a fearless yet careful approach to DIY, your renovations are within reach. The only question I have is, who's next?